We are all enrolled in the national health insurance system of Japan. You will soon receive a pink or blue card. If ever you need treatment, take it with you, and you will only have to pay 30% of the bill – check beforehand that the hospital in question accepts the insurance for your particular treatment. The national health insurance usually only applies to “illnesses and injuries”, so it’s often difficult to use it for health check-ups, routine dental cleanings, birth control, maternal care, etc. The national health insurance also covers a portion of treatment given abroad. However, you may make a claim ONLY if treatment abroad is unavoidable. Also, the amount paid for by the national health insurance is (technically) calculated as 70% of what the same treatment would cost in Japan. The Japanese government employs some ridiculous way of calculating this, however, and the actual amount usually winds up being only 30-40% of expenses. The best way to handle detailed questions about your insurance is to call your local insurance office. 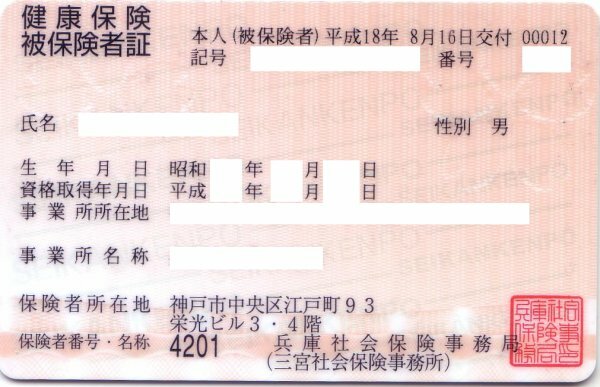 Your insurance office is written on the bottom right side of your insurance card (on the example card it is the Sannomiya Social Insurance Office, 三宮社会保険事務所). If you don’t feel that you’ll be able to communicate properly in Japanese, you can have a nearby Japanese speaker (JTE, supervisor) contact the office and help you fill out the forms. Info on the Hyogo insurance office is here. His/her income is less than 1,300,000 yen per year (1,800,000 if he/she is handicapped or over 60 years of age). His/her income is less than half of yours. If your dependent’s income is more than half of yours, but still under 1,300,000 yen and less than your income, the insurance office will make a decision based on your individual situation. As JETs we are also covered by JET Programme Accident Insurance, which is provided by the Tokio Marine & Nichido Fire Insurance Co. You should have received a book in Tokyo entitled “JET Programme Accident Insurance Policy Guide” that explains this insurance. Make sure you hold on to this book. Accident insurance covers us for trips we make abroad (covers expenses for the medical treatment of illness or injury sustained in an accident that occurred during the period of coverage). It also covers the remaining 30% deductible that we have to pay when we use our national health insurance card. However, dental and certain other types of medical treatment are not covered by the accident insurance. Also, it does not cover spouses or anyone other than the insured JET. Please consult the purple book to see what is and is not covered. If you need any assistance while processing a claim call their office: 0120-881-018 (0120-529-955 outside of working hours) or CLAIR’s JET Line at 03-5213-1729.